Chris Simmons says it was a ‘tough decision’ to step down as Billingshurst manager after just one season in the role, but said the fit wasn’t right for him or the club. The former Broadbridge Heath and Loxwood player took on the job - his first in senior management - last summer when the role was vacant. The club admits he was ‘thrust’ into the role at the time after having originally planned to play for the reserve team this season. 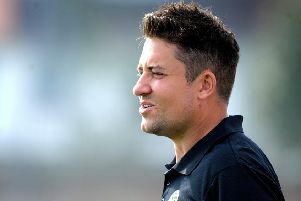 It has not panned out the way Simmons had hoped with the Division 2 side finishing third-from bottom in a season that was hindered by player availability. The outgoing manager explained: “It was a tough year and a tough decision to stand down, I really like the club and the people, Kev and Jan Tilley (chairman and secretary) live and breathe Billingshurst FC and I really appreciate their help and the chance. I feel I’ve let them down by leaving but it just wasn’t right for me or the club. “The player commitment was terrible. I only managed to play the same 11 two or three times in the whole season because of unavailability and again that is not good enough for a club at this level. “But it is a great club with good foundations and with the facilities always getting better, the right people can take the team and club where it deserves to be and I wish them all the best for the future. Chairman Kev Tilley said: “Chris let me know that he’d decided to give up the first team manager’s position and although it’s disappointing, we appreciate the difficulties he’s had in his first year of management. “He was rather thrust into the role in the first place and we’re thankful that he took it on. It’s a steep learning curve for a new manager, particularly at this level and when the season doesn’t pan out how you’d hoped, it becomes very frustrating, particularly to someone like Chris who has shown total dedication and commitment to football at whatever level he’s been involved with in the past.